Tuesday April 16th Buckcherry will be hitting up Pensacola’s Vinyl Music Hall – but it marks the beginning of a very busy year for the band. Check out all the oppertunites to catch them live below. 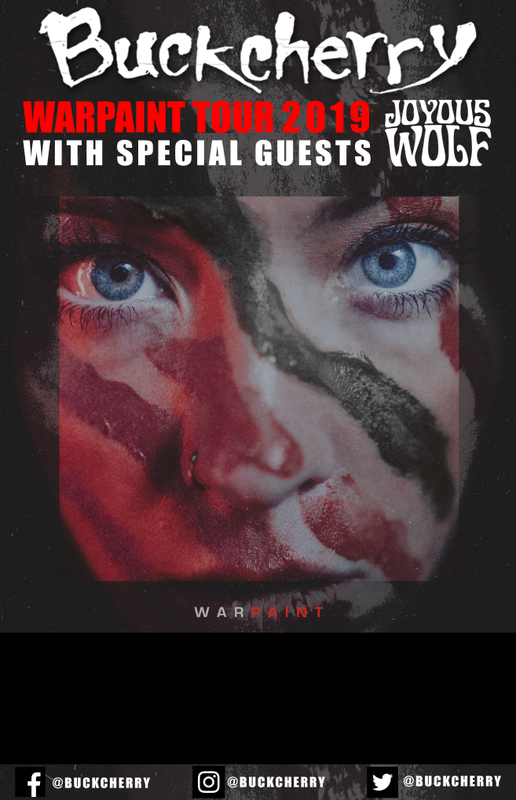 Continuing the support of the release of Warpaint and their first single “Bent“, Buckcherry announces today the dates for leg two of their North American tour. The tour starts on May 18th in Waco, TX and runs through August 15th in Kansas City. On top of touring all major markets in the U.S., the band will visit ten Eastern Canadian cities on this run. Joyous Wolf, who supported Buckcherry on leg one, will continue to support the band on most of the leg two dates in support of their debut release on Roadrunner Records. Buckcherry will also open for Aerosmith in Shakopee, MN and be direct support for Nickelback for two shows in Ravinia, IL. Dates for leg two are below. VIP packages are available at Buckcherryvip.com.